Today’s the great platform is WordPress theme for blogging. There are huge niche based blogs are increasing. The blogger want share their experience through blog site. If site is no good, it will be very tough for managing. In that case, WordPress is a good solution for blogging. Here is the collection of best personal blog themes. You will get good experience from these themes. All the themes have features rich option. Whatever your site like personal blog, travel related blog, e-commerce related blog, recipe related blog. These blogs are well suited for them who are seeking the best WordPress theme for personal website. CheerUp is a launching WordPress theme for blog website or magazines site. All the modern features are existing in this theme. 11 different gorgeous designs is ready for serving you. You have an opportunity to arrange your site within the 500 plus demo combination layout. CheerUp is a good responsive layout and SEO friendly. If you are interested to give slide in your site, you will allow doing it. Because of it’s much slider style. Neoteric footer and header style are ready to give different look of you site. CheerUp is compatible at modern browser. Let’s see the more details about CheerUp. Lets Blog is an inventive gorgeous responsive best WordPress theme for personal website. It is engaging itself in modern features like retina ready display, good design, retina ready, SEO friendly etc. Lets Blog has so many pre demos along with 20 plus slider as well as blog combination. It has so many options. Therefore so many opportunities for you to make your site according to your choice. Lets Blog prove you all the documentation after purchasing and their strong customer service is always ready to serve you. You will get 10 blog layouts to present your site and also you can add any video in your site. For more details about Lets Blog please visit below link because it is compatible with best personal blog themes. Grand Blog is come with a WordPress theme for blog website to impress the person who has a blog site. One click demo is ready to save your time by importing pages, widget, images etc. Grand Blog is good responsive theme. The theme is prepared for blogger. The blogger want to display their site in a very unique way with good features. Grand Blog is well suited for theme. Grand Blog is gained 93 thousand plus customer’s trust. You will get some example layout of this theme such as Classic menu, simple menu and many more. You will get shortcodes to generate your pages. There are so more features are waiting to welcome you! 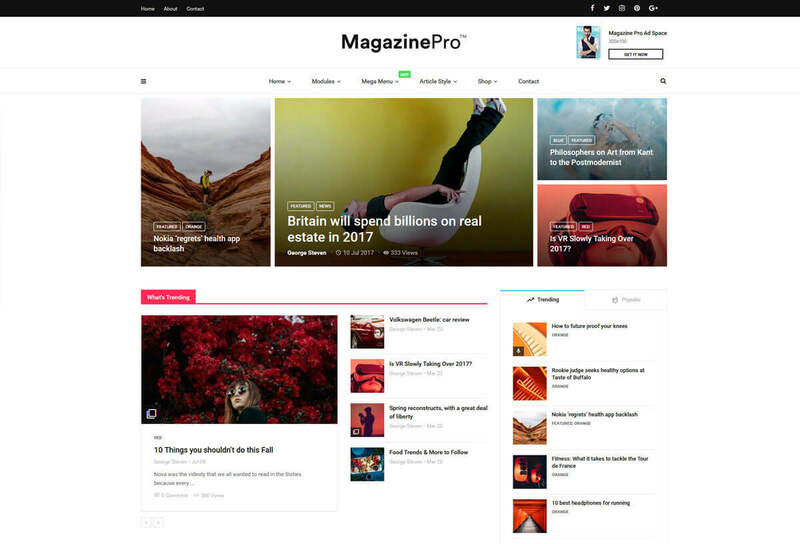 MagPlus is introducing a great best WordPress theme for personal website, magazines, newspaper. The theme is responsive and faster theme. It has own addons plugin which is latest version. Developing a site is not a very easy task. MagPlus developed in such a way that a user can make his/her site in an easier way. Lots of option is included here so that the theme is become more flexible for users. MagPlus give you an option to live customize. Ton of elements are ready to give unique layout of your site. 40+ templates are available here. You just see which one is well suited with your site. Among The best personal blog themes, it is consider one of them. Let’s see more info about MagPlus! 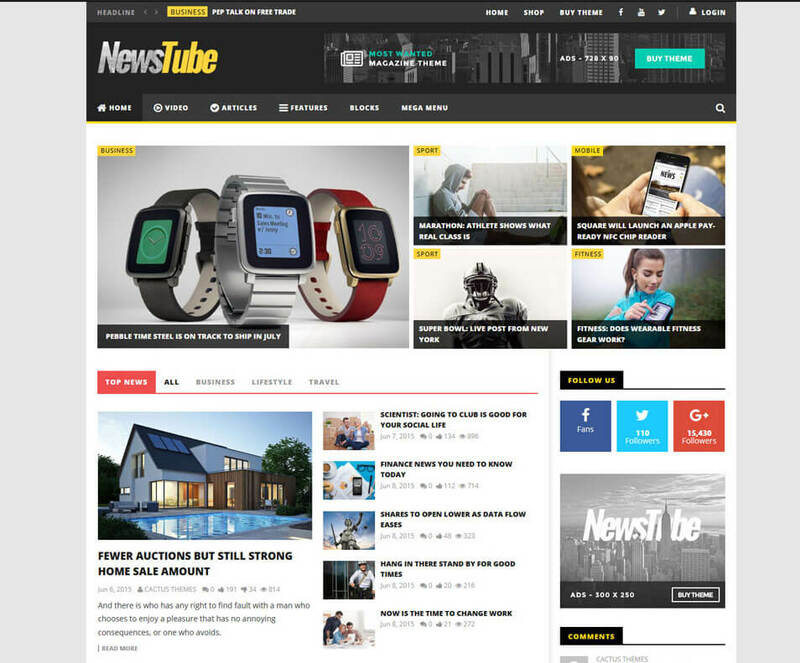 NewsTube is a responsive specialized WordPress theme for news blog ,blogging, magazine and video. Don’t worry about the video blog. In a video blog you can create video channel, playlist and so more. You will take video from most popular site like Vimeo. The theme layout is flexible and it is well suited at any video blogging. It is not only applicable for video but also for any type of blog or magazine site. It has limitless versatile layout variation, live post, and many shortcodes etc. NewsTu has an advanced theme option where you will have an option to customize your site. And there so more features are in NewsTube, let’s check it! 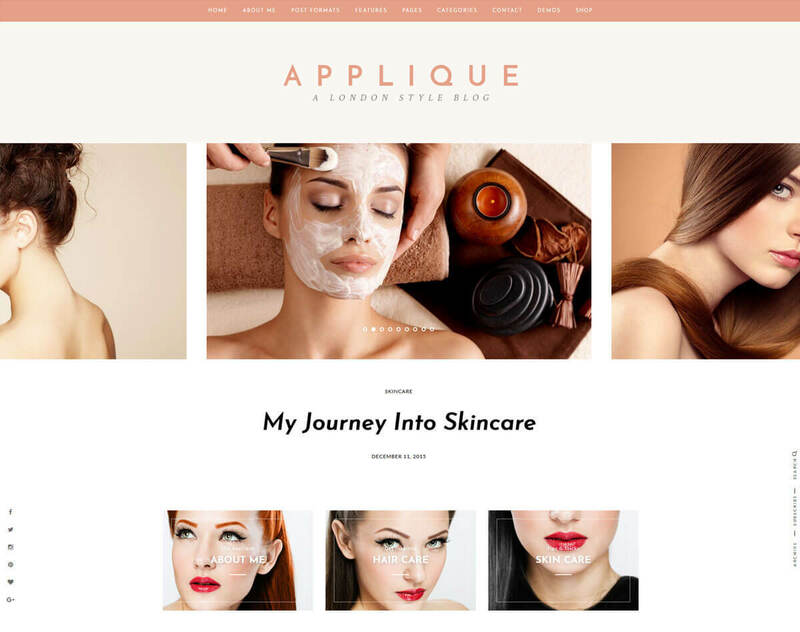 Applique is efficient responsive WordPress theme for blog website and fashionable site. 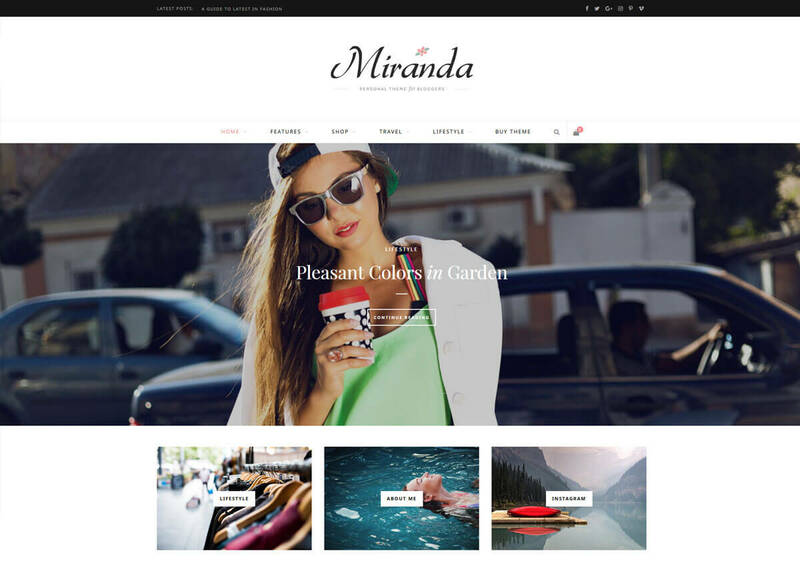 As it is fashionable theme so that the developer is concentrate on stylish during the developing theme. The theme is simple but elegant features. Therefore you may differentiate from other. The theme can use anyone without any hesitate. Generally blog theme are become light, simple , softened and intuitive. All of this peculiarity is having Applique. As it is a fashionable, you may have thought about online business. To meet your need Applique offers WooCommerce plus for doing online business. The design and features is simplicity but make it more beautiful. Let’s see! 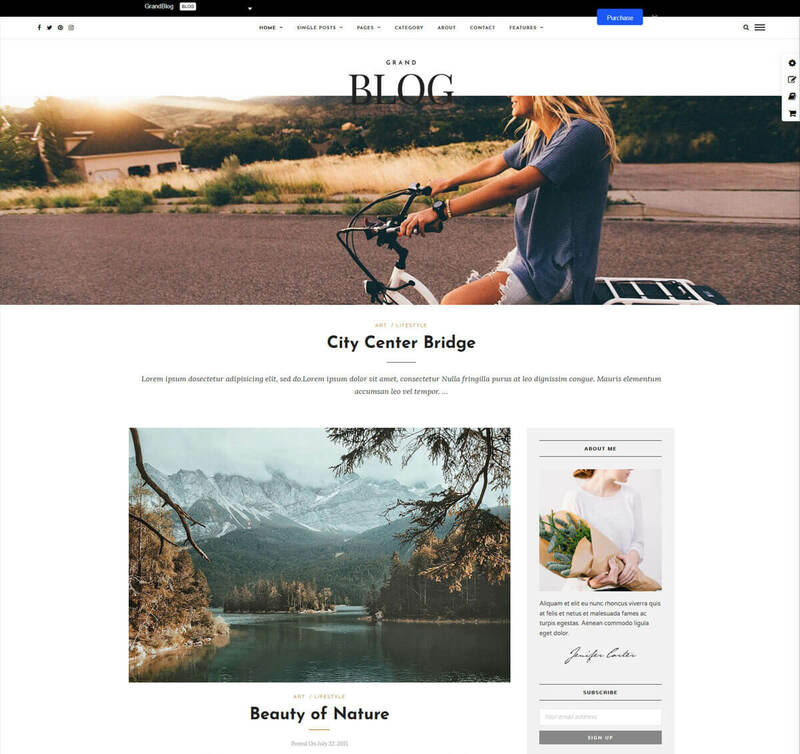 Smart Blog is a premium stylish WordPress theme for news blog ,blogging, travel blog, personal blog etc. It contains lots of modern features and responsive layout among of them. In addition, Smart Blog has navigation mega menu, retina ready display, 3 different header styles etc. The theme design is elegant quality. It has “WOO Sidebar” through which unlimited side bar option is providing. Ton of necessary shortcode is offering you. You may customize every page if you want. 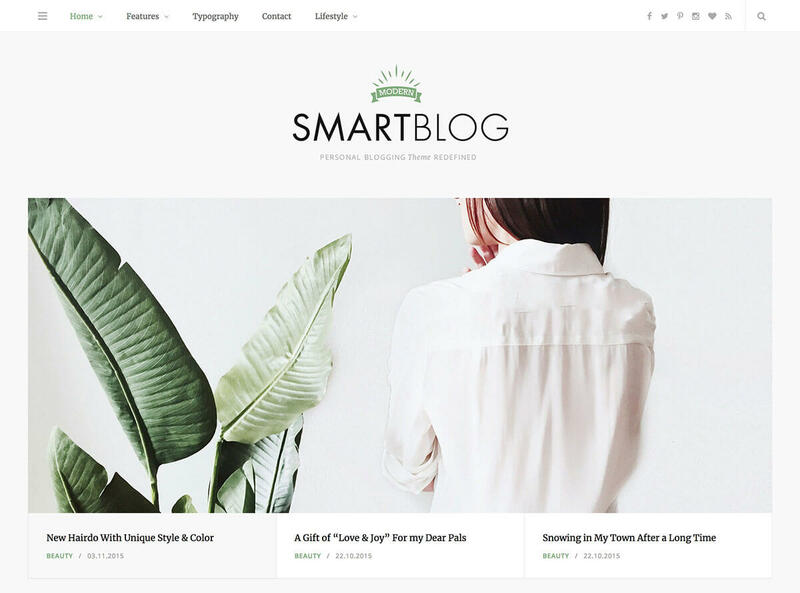 Smart Blog has so many features such as Wide & boxed layout versions, mega menu, different type of blog post such as standard, link, audio, Quote & so more. Please see for more features about Smart Blog! 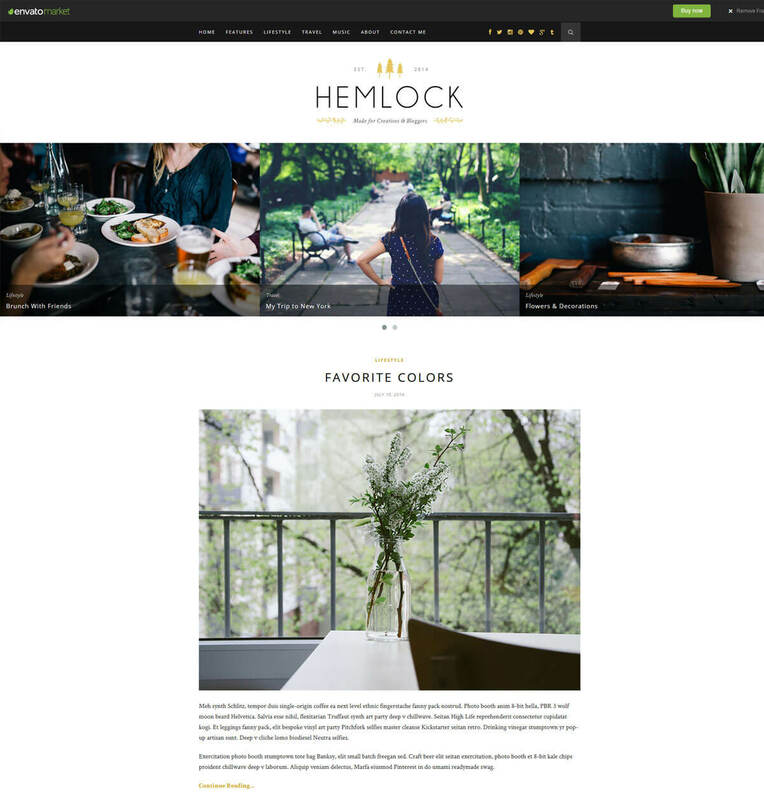 Hemlock is esthetic and candid WordPress theme for blog website. The functionality & features make this theme different from others. Hemlock is responsive and compatible at any device. You will get idea about the Hemlock when you the subscribers and comments. Comments & rating will help you to take right decision why you purchase this theme. The theme is always updated according to modern trends and you will get the update version if you purchase once. Sp let’s see more details about Hemlock ! Allure is come with a fashionable WordPress theme for blog website who have interested in this area. Fashion related blog generally make more unique way and eye-catching. Therefore, you will get different eye-catching homepages. 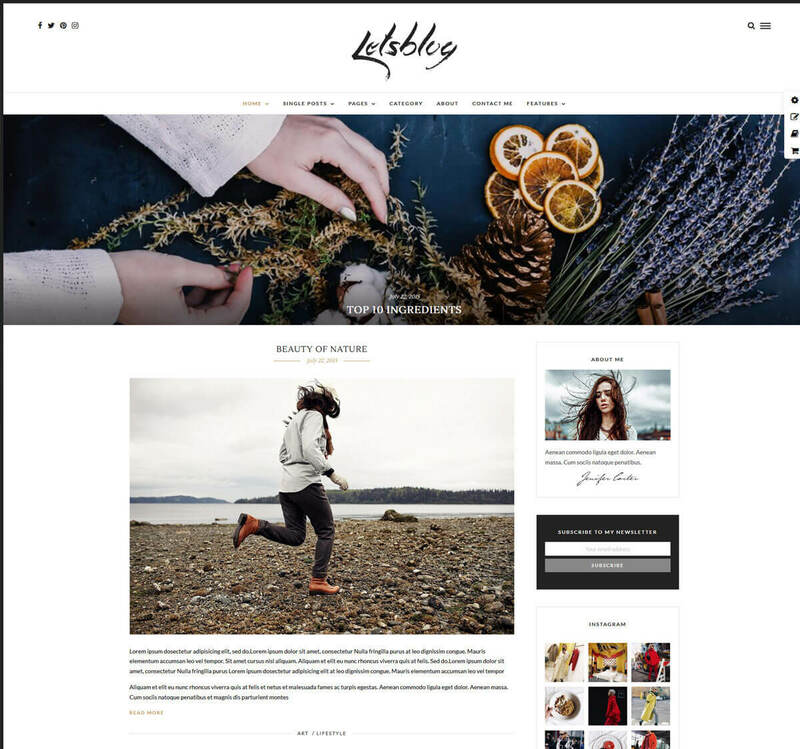 Versatile Polished header style, gorgeous blog slider will help you to get attention of your audience. You will do custom format such as audio, gallery, video etc. You can share your blog in social media u and for this, Allure has social functionality. Blog Post Carousel, blog post standard or two columns or more, you will have opportunity to do that. Please check the functionality of Allure! 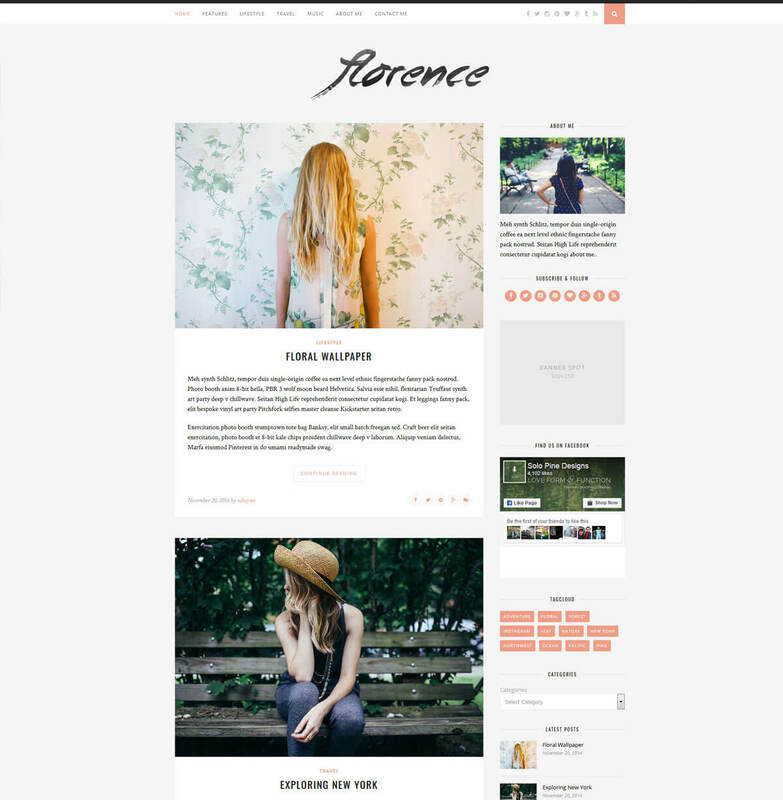 Florence is a classic premium best wordpress theme for personal website, news blog, blogging. The modern trend responsive feature is included here. You will get here diversity of post layout option. The flexible design along with retina display is displaying good looking. Florence is offering you clean shortcode, background, ample color option etc. You will get theme option for doing or customize your site according to your needs. Custom Widget like facebook, about me, social etc. is included in this theme. Variety of post format you will allow to use it. In addition, limitless color option is ready to give good combination of your site. Let’s see the details about the Florence!